EPM 360 is a five day assessment program performed by CPM consultants for leading CFO organizations to assess the current business landscape, benchmark against your competition and define EPM maturity levels while building a best practice Enterprise Performance Management roadmap to get you there. Assess your EPM readiness with EPM 360 by CPM Consulting. Maximize enterprise performance with SAP EPM solutions. 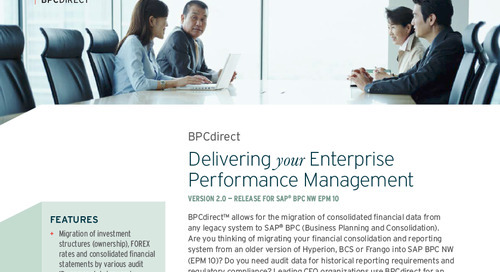 Migrate consolidated financial data from any legacy system to SAP BPC.